Oceanfront chalet, situé dans la pittoresque rue Margaret’s Bay. Endroit privé et paisible dans une rue calme, proche de toutes commodités. Cottage récemment rénové, ainsi que tous les nouveaux meubles et les draps. Une vue imprenable sur l'océan et les couchers de soleil depuis le chalet et la terrasse en bord de mer. Réveillez-vous au soleil qui traverse les arbres et les bateaux de pêche au loin. Plongez dans l'océan ou faites un barbecue sur le pont tout en écoutant les oiseaux de mer et en regardant passer les voiliers. Faites des batifolages sur la grande pelouse ou faites un feu de joie sur le rivage (bois de chauffage fourni). C'est l'endroit idéal pour se détendre. À dix minutes de Peggy’s Cove, à proximité des plages, des terrains de golf, des clubs de voile, de superbes restaurants et des boutiques. Canoë, kayak de mer, pêche en haute mer et excursions d'observation des baleines vous attendent. À seulement dix minutes de deux grandes épiceries, d’un magasin d’alcool et de la restauration rapide. Situé à 30 minutes de la région métropolitaine de Halifax, à 10 minutes de Peggy’s Cove et à 45 minutes de l’aéroport international de Halifax. Situé sur la route des phares, à proximité des villes historiques de Lunenburg, Chester et Mahone Bay. La vallée d'Annapolis est également facilement accessible depuis cet endroit. We were so happy with our week stay at this property. We absolutely loved the location - tucked away off of Peggy’s Cove Road (super quiet!) and a 10 min drive to anything you might need. The cottage was super clean and organized, and we appreciated the beach chairs, towels, coolers and ice packs. We flew into Halifax, and so appreciated all the closet space to keep our suitcases hidden. The washer/dryer was also an asset while traveling with a toddler. We wish we could have stayed for two weeks, but hope to be back again in the near future! We would 100% consider staying here again, and would recommend this cottage to anyone considering it! You won’t be disappointed! Family fun on the waterfront! It had been my grandma's dream to rent a house in Nova Scotia during the summer to invite family to come visit and enjoy time exploring the area with her. The trip was a wonderful time, and will be a special memory for all of us, in large part thanks to the house, accommodations, and surroundings in Seabright. We were super comfortable in the beds, and the relaxing living room. We enjoyed cooking family meals in the kitchen, and dining looking out on the water. And of course we had such a great time down by the water, enjoying fire pits at night, and listening to the waves and the birds out at sea. In the neighborhood, we enjoyed being so close to Peggy's Cove, and the White Sands Bakery near by (a couple of times, we even went multiple times a day!). Overall, the location, and accommodations made our trip a smashing success, and I would recommend that anyone stay here if they are looking for a place in Seabright. What a place! On a secluded lane off the main road to Peggy's Cove, this home offers privacy and peace -- close enough to shopping for staples but just as close to humble galleries, a local lobster pound and inspiring coastal hikes at what appears to be the end of the world. The first thing we noticed when we drove down the pretty, curved drive was how quiet the property was. This proved true the entire week; we heard only the local wildlife and the serene waters of St. Margaret's Bay. The views from the home and its well maintained lawn, porch and seaside deck were as calming as anything we'd ever seen. The cottage itself was simple, tasteful and comfortable without being overwrought. The kitchen came equipped with things that, omitted from other rentals, can yield a less enjoyable experience (e.g., basics like salt and pepper, plenty of linens, soap, paper towels, etc.). The living and eating areas were decorated nicely and appealing. The bedrooms and bedding were cozy. Other reviews praising the owners and managers for thinking of everything are earnest. Some additional items that left us impressed, among many, were a stockpile of cut wood for the fireplace and outdoor fire pit; a clean grill ready for cooking; a closetful of anything we'd need for a picnic or a day at the beach, including an umbrella, mats, towels, coolers and a basket; and even a number of ice packs in the freezer. We came away with the impression the owners and managers genuinely worked hard to please their guests. They did not fail! We live in an age when, alas, the lovely little cottage is disappearing. This no vulgar monolith. If you're looking for a home that is beautifully maintained, tasteful, placid and exceedingly comfortable, you would do well to reserve a stay in this wonderful place. This VRBO rental was immaculate and had everything we needed for a wonderful stay. It is right on the ocean (the pics are very accurate); we loved having breakfast out on the back deck and staring out to sea. The owners left us a bottle of wine to welcome us and everything we needed to build a fire in the fireplace was already laid out and ready. We actually didn't use the fireplace; rather we built fires outside two of our nights there (again everything we needed was there and ready). This place is wonderful and I think would be great for a family rental or friends (there were just two of us and it was still perfect). The owners have thought of everything! Also, this location is really well located to explore the area. Tantallon has plenty of stores to get supplies, and has a place, the Bike and Bean, that rents bikes to use on the St. Margaret's Bay rail trail; there are also places to kayak and some great restaurants nearby. We stayed at this property for 4 nights in July 2011 and wished it could have been longer. 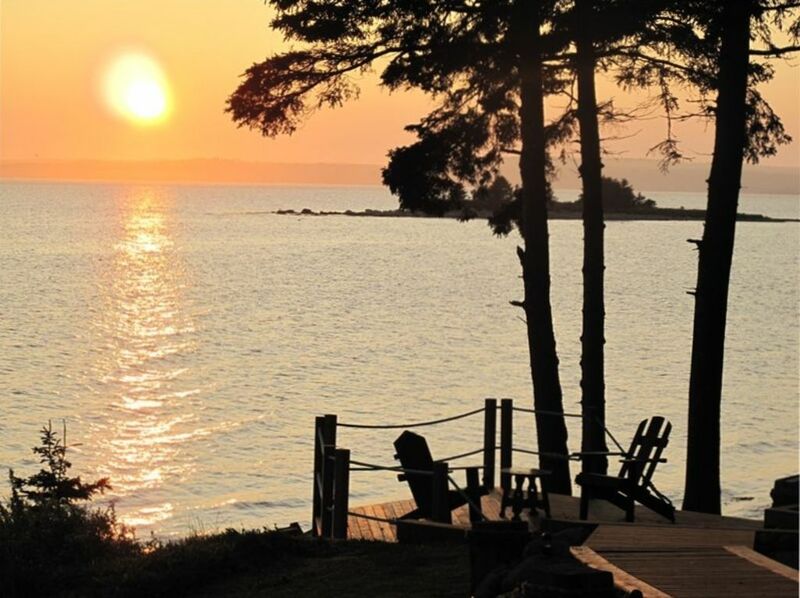 The house is beautifully situated, right on the waterfront with lovely decking and outdoor furniture to sit and watch the sunset whilst sipping a Nova Scotian white accompanied by fresh lobster! The interior of the house is even better than the photos suggest and Carol has very thoughtfully provided everything you could possibly need for a perfect stay right down to folding chairs and a picnic hamper for venturing out for the day. The property was immaculately clean and the local couple who met us at the cottage to check us in were extremely helpful and friendly. One morning when we woke to find the power was cut off (due to a line fault up the road) and we had no hot water they even opened up the owners actual property nearby so that we could shower which we really appreciated. Correspondence with Carol was always quick and efficient and coming from Australia we really appreciated being able to pay the deposit via paypal. I would recommend this property to anyone wishing to visit this beautiful part of Nova Scotia. Being keen photographers, we spent many hours at nearby spots such as Peggys Cove (early in the am and late pm to avoid the bus loads of day visitors), Indian Harbour where we met a lovely local storyteller, the Swissair 111 memorial site and indeed this whole coastline. Another day we visited Lunenburg and Mahone Bay and another day went further afield to the Gaspereau wine region and eventually Digby. All in all, a beautiful place to visit with very fond memories and we hope to come back one day! Off-Season Rates also available. Cancellations more than 60 days prior to the arrival date will incur no penalty. Cancellations less than 60 days but more than 30 days prior to the arrival date will forfeit only the rental deposit. Cancellations or changes that result in a shortened stay, that are made within 30 days of the arrival date, forfeit the full advance payment and reservation deposit. However, if the cottage is re-booked for the cancelled reservation period, the full advance payment will be reimbursed less the reservation deposit. Early departure does not warrant any refund of rent or deposit.